You know when you meet a new friend and you immediately love everything about them? Communication is easy, your sense of humor is similar, and your interests strike the perfect balance between alike and diverse. And just when you think you couldn’t adore them anymore, something else is revealed, an extra nugget of their goodness that crystalizes your relationship. It’s like an ‘aha!’ moment. A discovery that seals the deal. And you go forward with a knowing. “I knew I liked them. I knew we were connected. I knew we’re supposed to be in each other’s lives.” I call these cherries. These days it seems like my whole life is one big delicious sundae and anything extra is just a cherry on top. I’ve recently had two really great cherry on top events, one was with an actual new friend that fit the template described above. A coming together that solidified that I want this person in my life for the rest of my days. At 44 years old, it’s not often you feel like you’ve made a new best friend. It’s refreshing and life affirming and a gift from the universe. The other cherry on top moment involved actual cherries! 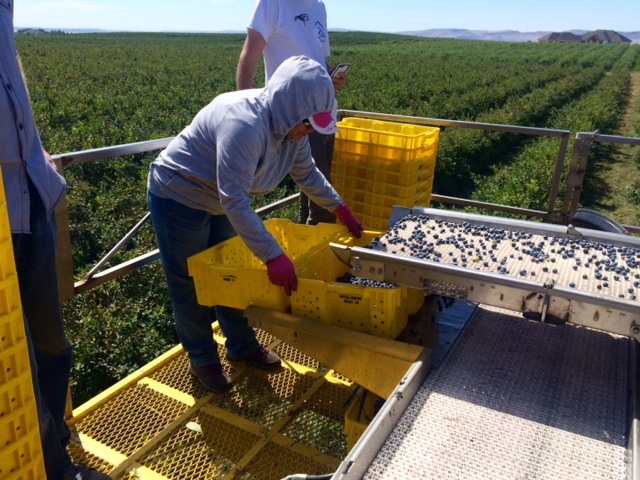 Last week I was a guest at the Stoneridge Orchards cherry harvest at Dorsing Farm in Royal City, WA. I am a brand ambassador for Stoneridge Orchards and I’ve had a rewarding relationship with them for the past few years. 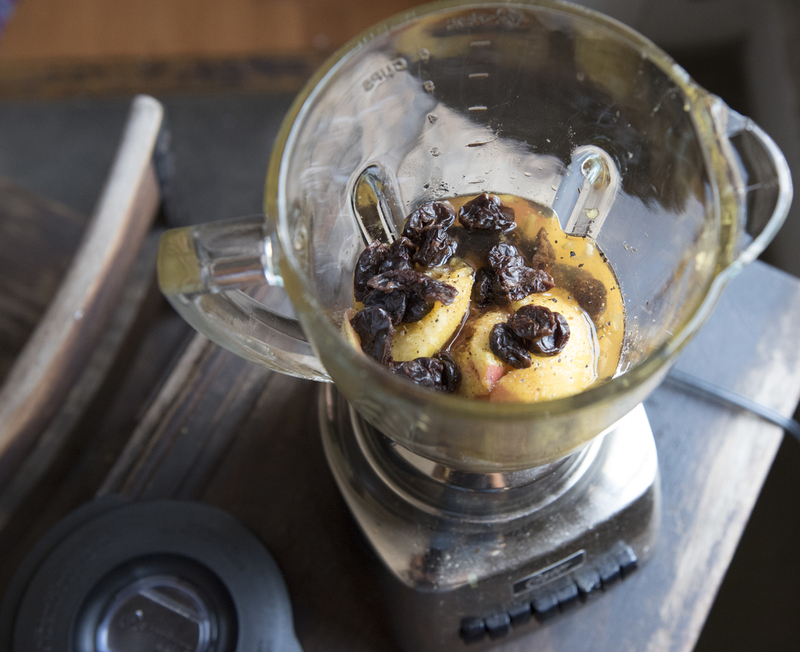 I create recipes using their dried fruits for their website and video series. I do cooking demonstrations at live events, make food items for media deliveries, and help represent them at food festivals and shows. It was such a treat to be chosen to be part of their actual cherry and blueberry harvest! It was a media event for editors and magazine writers and I got to cook for them and share my genuine love for Stoneridge Orchards. 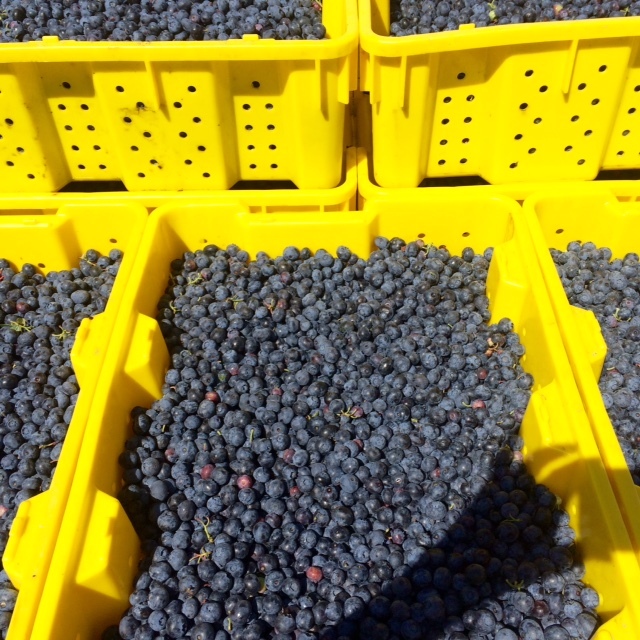 Stoneridge Orchards is owned and operated by the Dorsing family on a farm of about 2,500 acres planted with cherry and apple orchards, blueberry fields and two lines of dried and frozen fruit for the wholesale and consumer markets. The true roots of these fruit bearing trees and plants are family tradition and love. The hard work and pride that has been passed down through five generations is worn like a family crest by the Dorsing men and women. I am convinced that the dried fruit that I enjoy so much and this brand I represent really gets its high quality and flavor from this tradition, hard work and pride. Sure, the high desert climate makes for good fruit growing, and they have a cracker jack team of pickers, sorters, dryers, and packagers, but when I open up a bag of SRO’s dried cherries or blueberries, I can taste the love. The harvest! The Dorsing brothers took time out of their busy lives of running the business to create a full experience for us. Our day started with a tour of the orchards and fruit growing fields, followed by a lunch hosted by the Dorsing family ladies on the farm, and then a fascinating tour of the processing plant. I finished up the day serving up some Stoneridge Orchards treats I’d prepared for everyone and a bit of a cooking demo. The marketing team printed up a really sweet cookbook of pictures and recipes from contributing chefs, (mostly comprised of my food and recipes!) I’ll admit I’ve been opening these little bags of ruby cherries and sapphire blueberries for a while now and not once have I thought about how they came to be, where they came from, or how they got inside that little bag. It made me think about so many other amazing things in my life that I take for granted. We all took turns driving the hydraulic cherry tree shaker that attaches to the trees and vibrates them vigorously onto a conveyor belt with a catchall ‘pan’ that collect thousands of ripe cherries while keeping trees healthy and undamaged for future growing seasons. It literally rained sour Montmorency cherries! The sweet cherry harvest had happened the week before, but we got to visit some trees that still had some fruit to offer to learn how the sweet cherries are hand picked. Never have I ever tasted a cherry so delicious. I am ruined for cherries now. There is no possible way for the flavor of the Dorsing’s over ripe left over sweet Skeena cherry harvest cherries to be topped. By anything! Next stop: blueberries. I'll be honest, I have an affinity for low bush wild Maine blueberries. Until now. We tasted our weight in about 5 different varieties they grow on the farm. I’m now a Draper girl. Who knew? 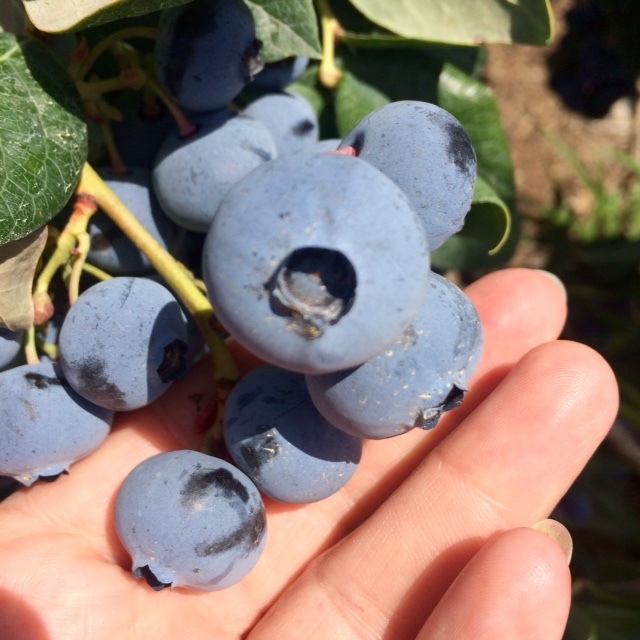 We climbed atop the blueberry picker that combed through the bushes and were surrounded by the perfume of buckets and buckets of these little blues. The processing plant was a lot like Willy Wonka’s Chocolate Factory. So many magical workers behind the scenes making sure that every single piece of fruit that makes it into a bag is of superior quality. Conveyor belt after conveyor belt bleeding red and blue from the pounds of fruit making their way from check point to check point. It was hypnotizing to watch. The drying rooms just smelled like cobbler. Truly. Cherry or blueberry cobbler baking away in some grandmother’s oven came to mind with the smell of the fruit drying. The true cherry on top for me was meeting Terry Dorsing, one of the grandfathers of the whole operation. We traded world traveling stories and talked about the progress of the world around us and how we manage to keep up. And this man, one of the most important men of the family and farm, cleaned up after little old me once I had completed my portion of the program. HE washed MY dishes and wiped down my table. It was inspiring and humbling to see that no job is too small, no one is of higher station, and that when there is work to be done, you work until the job is finished. I love this company so much and I had no idea what I feel for them could be improved upon. I am proud to be on their team, but after harvest with the Dorsings, I left feeling like I was one of the family. For your own cherry on top experience, click on the Stoneridge Orchard bag you see in the top right side bar of this blog or on the colorful line up of their dried fruit bags on my website home page and order some of these dried fruit treasures. (They even come dipped in chocolate!) Taste the love and feel like you’re part of the family. Here’s a summer time treat with healthy ingredients! Pour the coconut milk and almond milk into a small bowl. Give it a whisk or a stir to combine well. Stir in the chia seeds, 1/2 teaspoon vanilla, and 2 tablespoons honey and let sit, stirring once or twice, for about 30 minutes, to allow the seeds to expand. In a blender, combine the coconut water, peaches, remaining vanilla and honey, a sprinkle of salt and pepper (salt brings out the sweetness and pepper gives an earthy little kick to the peaches.) plus the 1/4 cup dried cherries. Pulse to puree peaches and break up the cherries. Fill popsicle molds 1/3 of the way full with the chia mixture, dropping in a few loose cherries. Then add a layer of the peach and cherry puree. 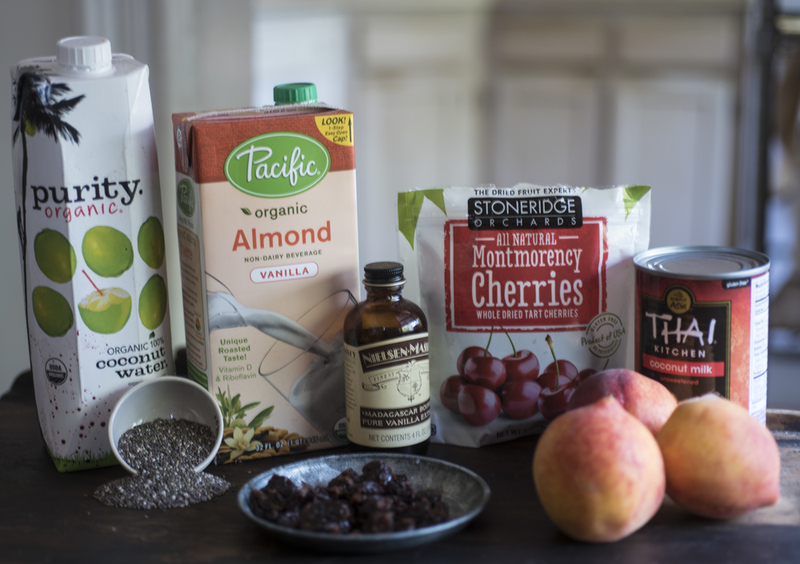 Add another layer of chia pudding. Rap the mold firmly against a hard surface to encourage the pudding to fill all the nooks and crannies in and around the fruit. Insert popsicle sticks into the molds, they will stand up by themselves. To remove from the molds, fill a sink with hot water, just deep enough to immerse the mold up to, but not over, the rim, and hold the mold in the hot water for about 15 seconds to loosen the pops. Pull the popsicles out of the mold and enjoy. Pudding pop images by cheryl Stockton of Stockshot Studio.